If you go to my SoundCloud page there’s more. 2017 – Delphine Dora and Sophie Cooper – Think Away, Cassette on Was ist Das? 2016 – Mike & Cara Gangloff, Jake Blanchard and Sophie Cooper ‘From Sulphur House’, split 7 inch lathe cut with Alistair Galbraith on End of the Alphabet Records. 2015 – Sophie Cooper / Delphine Dora – ‘Distance Future’, C40 on Was ist Das? 2013 Sophie Cooper / Ignatz split cassette on Tor Press. 2009 Sofie Sea – ‘True Stories’. CDR edition of 50, self released. 2015 – Rivers, Rushes and Rodents, Leigh Folk Festival comp. 2014 A Berry Feast 2014 – The Compilation. 2010 – ‘Cardboard Hawaii’ installation at Elevator Gallery, Hackney Wick, London. Multi-media art installation complete with musical soundtrack composed with samples taken from Hawaiian cassette tapes. Collaboration piece with artist Billy AB and help from Rahul Bery, Alannah Chance, Jen Glyn and Clemence Bartram. Part of Elevator Gallery’s ‘Dada Supercharger’ event. 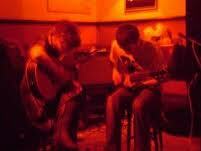 A double gtr duo with Kelly-Jayne Jones playing long variations on themes. We were inspired by seeing Ben Reynolds and Andy Jarvis play at Stoke-on-Trent’s musicroooom, listening to Bert & John plus a few bottles of red for nerves. We would also play with Pascal Nichols on drums from time to time. Photographed for Bristol’s Venn fest press. CooperJones played a gig supporting Leopard Leg in our friends front room in Manchester. After seeing Leopard Leg play I asked if I could jam with them sometime and I was invited me to stay with them in Brighton for a couple of months. It was a great experience and opened me up to the joy of playing with a huge group of people. I went round to Billy AB’s house in Manchester to have a jam with his housemate Gaz who’d forgotten and wasn’t in. Billy offered to play with me instead and we formed Tom Cool (named after a guy I went to school with who’d made me the compilation tape which Billy and I recorded that first jam over). This was a psychedelic instrumental guitar/keyboards/vocals band mostly although we did have a stab at being a Neil Young covers band once. I met Ben in Sheffield when he was doing the sound for a gig I was playing there although I didn’t remember this for years and thought I’d just met him out one night in Manchester. We recorded two albums for Blackest Rainbow records and played two gigs in Sheffield. This is a flexible title for my solo song work. I’ve also used Sophie Cooper when playing live recently. I’ve written songs mostly using guitar, keyboards and various pedals but with the main focus being on words/song. The songs are mostly based on real life events. Gals with Guitars is a large scale participatory project I co-manage with artists Sharon Gal and Andie Brown. We invite women of all guitar playing abilities to attend a workshop that is run over two days. During the workshop we compose a piece to be performed live on the second day. Wing Horses – with Billy AB (keyboard), Ellen Mary McGee (Drums and vocals) and me on acoustic guitar. Long form psychedelic songs. Remedial Queen of England – with Joincey (electronics), Andie Brown (bass guitar) and me on electric guitar. Full spectrum drone. Palm Harts – one off collaboration with Pascal Nichols. Double Casio VLTone and microphone noise battle. A-Band – I’ve played live with the A-Band on a few occasions, always a hoot.